We live in a world where everyone is yearning to be perfect. We live in a world where the imperfect is judging their fellow imperfect beings for not being perfect. What an irony right? The truth about life is that, there is no person on earth that is without flaws. The only person without flaws is God Almighty. Yes, the bible says ''we should thrive for perfection like Jesus. Unfortunately, But many misinterpret this saying. Yes, we are ''gods'' because we are the children of the Most High God (Psalm 82:6) but do not forget that we are ''gods with mortal bodies'' not ''God with an immortal body''. Our mortal bodies makes us imperfect. Our mortal bodies need strength from God to draw us nearer unto perfection. Our flaws can also be said to be our weaknesses. You do not need to be ashamed of your flaws/weaknesses. Neither do you need to run away from them or disregard them or pretend that you do not have one. This clearly makes you live a life filled with lies. 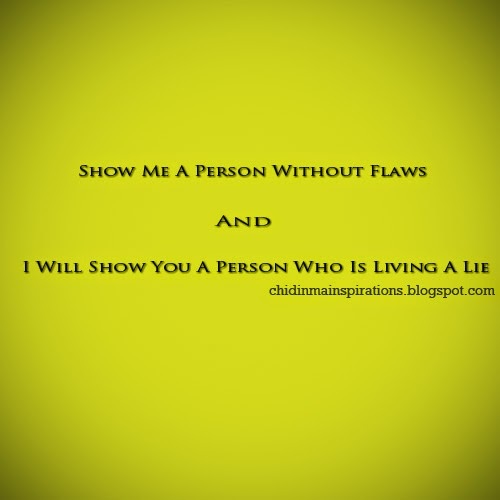 Like the picture above clearly says ''Show me a person without flaws and I will show you a person who is living a lie''. You just need to ask the Holy Spirit to help you work on your flaws/your imperfections/your weaknesses rather than disregard them. For example, the fact you go to church doesn't make you perfect or sinless neither does it give you the right to judge or condemn others. Let's say Mr/Miss/Mrs A do tell lies and also fornicate and Mr/Mrs/Miss B and C judges, condemns and criticises Mr/Mrs/Miss B meanwhile, they gossip, keep malice, are hot tempered, steals etc. (Matthew 7:1-3). You can see where I am going right? Rather than judge/condemn/criticise the person telling lies or the person who fornicates, why not pray for him/her to change. One of the things God loves His children doing is intercession (praying for others). Besides, Mr/Mrs/Miss B and C might be judging, condemning or criticising Mr/Mrs/Miss A that his/her actions will lead his/her to hell but they fail to understand that, that the simple act of judging/condemning alone is already a direct ticket to hell. This is because, only God Almighty has the right and power to judge/condemn ( James 4:12, Psalm 75:7). We need to understand that we are all imperfect beings working towards perfection like God. This doesn't make us perfect, this makes us human. Whether it be an affluent person or an average person or an intelligent student or an average student etc, everyone has his/her own individual flaws. Everyone is trying to work on themselves. Everyone has that one thing they need to improve on. Owning your flaws and working on them doesn't make you an evil person, rather it makes you human. It makes you a mortal being working towards improvement. So I ask, are you living a lie? Are you running away from your flaws? Are you judging others based on their flaws despite the fact that you have yours? I leave you to ask the question.